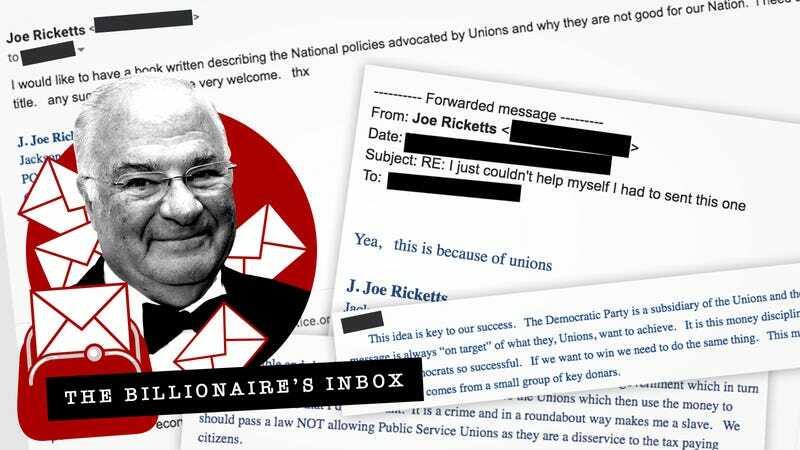 Joe Ricketts, personal net worth $2.2 billion, is a private man. With less name recognition than some dark money donors, yet a comparable interest in trading wealth for political influence, the 77-year-old conservative takes great pains to keep himself out of the press. He does not grant many interviews, preferring to furnish potential profile-writers with a list of confidants (many of whom share his last name) to praise him for his grit and excellent business sense. And those family members providing glowing quotes are rather influential themselves: One Ricketts son, Pete, has served as the governor of Nebraska since 2015. Eldest son Tom Ricketts is the chairman of the Chicago Cubs, a franchise the family collectively purchased in 2009. In 2012, daughter Laura Ricketts, a Democrat, started LPAC, a Super PAC, aimed at lesbian women; she was a top bundler for Hillary Clinton’s 2016 presidential campaign. And this year, the youngest Ricketts boy, Todd—who withdrew his nomination to serve in the Trump administration in 2017—became the finance chairman for the Republican National Committee. “Dad gives rich guys a good name,” Todd Ricketts told Fortune magazine in 2012. Such press mentions are tracked aggressively by the political consultants and PR flacks hired by the family to manage its public profile, including those at the influential Hollywood firm 42 West, as evidenced in emails obtained by Splinter. We will be sharing excerpts from some of these emails, which span between roughly 2008 and 2013, in a series called The Billionaire’s Inbox. After all, it is not often that you get to hear from the American titans of industry and political influence in their very own words. Some of these emails have been excerpted or redacted to protect the privacy of individuals involved and, occasionally, for clarity and length; we have noted where we have done so. Since generating his vast wealth though a series of mergers and acquisitions that eventually saw his business, Omaha First Securities, folded into TD Ameritrade, Ricketts has enjoyed all the fine things large sums of first-generation money can buy you in America: motorcycle trips and Chilean fly-fishing expeditions; a 1,300-acre ranch in Wyoming and a 78th-floor penthouse apartment off Central Park; a bison-raising business; a film company specializing in historical cinema; a sports team; and a handful of very well-funded political actions committees. And as of last year, Ricketts could add to that list the ability to shutter a beloved local news website, one of the last dedicated solely to intimate beat reporting in a city of 8.5 million, out of what appeared to be an anti-union whim. In 2016, Ricketts and his wife Marlene were among the top 20 contributors to federal campaigns, donating over $15 million. When Donald Trump found out they had spent $5.5 million in an attempt to block his nomination, he was furious; after the now-president was officially nominated, they donated or raised many times that sum as a contribution toward his effort. In addition to taking advantage of deregulated campaign finance laws through the 2000s, Joe Ricketts also founded as one of his late-in-life amusements a website called DNAInfo. The hyper-local news outlet would come to cover both New York City and Chicago. Given the patriarch’s resistance to speaking candidly to the press, and his lack of experience as a media exec, some wondered why he even did it. The sites assigned beat reporters to specific neighborhoods throughout the city. As the New York Times’ metro desk shrunk and local papers lost ad revenue to national digital outlets, DNAInfo reporters were among the last covering community board meetings and keeping an eye on local politicians. In a statement provided to Gizmodo Media today, Joe Ricketts says he “started DNAInfo with the goal of building a successful company that would report objective neighborhood news and information,” and remains proud of the unbiased reporting the publication produced during its operation. “I’ve made no secret about my feelings when it comes to unions,” he continues. “In today’s business environment, the companies most likely to succeed are those where ownership and employees are truly in it together.” We have included Ricketts’ full statement at the bottom of this story. In emails sent between Ricketts and his team during DNAInfo’s run, it’s clear the billionaire entrepreneur monitored the site closely, receiving regular traffic updates and dictating the exact placement of certain reporters’ photos. Early hires were administered the Watson-Glaser Critical Thinking test. And as he chided his employees for bias he detected in their inclusion of too many pro-taco truck quotes, he pontificated elsewhere on the dire state of the news media, the “radical left press,” and why unions made him feel, “in a roundabout way,” like a slave. If the logo appears to communicate some connection Christian tie-in with the brand, the objective value of DNAinfo could be compromised and, particularly given Peter’s conservative, family values campaign platform, we should assume that the “liberal” press will be looking for such angles when they write about DNAinfo and the fact that Joe Ricketts is behind it. Anschutz has gotten a lot of this with Walden Media – the press suggesting that his film selections are intended to promote Christian values etc. which has alienated some potential consumers. Do we have a liberal bias talking about the progressive womens dinners. Happy to see the progress that you folks are making. I have a comment on the Bernie Madoff reporting. Certainly Bernie was domiciled in NY for work and residence. However, is this a Local Story? I think it is a National and International story , stuff that we can’t compete on at this time. Although we probably need to mention things like this I think we need to keep them Local. We can talk about this some more a little later. I think using Manhattan Local News is just fine for a tag line. Using the words “and views” makes me nervous. I don’t want opinions or reporter views to be a part of what we are doing. We can report other peoples views and make them balanced but we shouldn’t ever have an opinion or view as DNA. I don’t want my views on my news/information service nor the views of anyone. This is what will make us different. People are tired of slanted news and for us to offer something fresh, that is, fact without views is what may help us to become successful. We can talk more about this also. My wife and I are now leaving for the Calgary Stampede and I’m excited about going. Thanks for offering to send this on. I think what is happening to Paula borders on criminal and it disturbs me. RFD-TV is headquartered here in Omaha and has a huge audience. It is targeted at rural America and a person has to be rich to be a farmer or rancher (irrespective of how they may want to present themselves) and it is great market to advertise to. The owner and CEO is a friend of mine and I’m sure that he would entertain having Paula on that network if she would have any interest. I think that Paula is such a strong personality and great entertainment persona that she can win the battle if she wants to. In my opinion she needs to get back on TV, get another publisher and start a Public Relations campaign. This is my humble opinion for whatever it is worth. Hi Joe. [Obamacare] Poll toplines attached. As you can see, they have an intensity that is extraordinary, exceeding Ground Zero Mosque. Maybe invading Afghanistan after 9/11 was in this ballpark, but I don’t recall seeing anything else remotely like this. It occurred to me that it might also help your marketing to call this not the IWV poll, but the DNA/IWV poll when I or anyone else reference it in an op-ed. But I don’t know if you want to do that. I’ll let you review and then we can talk. I have a conf. call w/ Sen. Vitter at 5:15 EST, but otherwise am at your disposal this evening. Is there polling data available specific to New York and Chicago? ObamaCare is definitely a hot-button issue that people are concerned/confused about nationwide. I’ve already got my team working on a story about what New Yorkers can expect and need to know when ObamaCare goes into effect next month. Is there any data specific to New York that’s available here? Publishing a national political survey will confuse the editorial staff about whether our mission has changed. (And I think it could confuse DNAinfo’s readers and local merchants/advertisers as well.) DNAinfo has strived since the beginning to provide news and information free from bias or politics with a relentless focus on neighborhoods. Sponsoring a national poll on a divisive political issue is unlike what DNAinfo has done/been about up to now. Polling can be a powerful editorial tool and it would be good to conduct surveys on topics relevant to our neighborhood readers. A survey of our readers or New Yorkers on ObamaCare would be great, as would their take on, say, the mayor’s race or other hotly contested local issues. Is there a way these pollsters could conduct these types of polls? Looking forward to discussing this further. After visiting with you and Alfred last week I reviewed the new Web page. I am uncomfortable with telling the world that we will expand to other cities and markets: I would like to have that part of the page deleted. First of all we haven’t found the operating activities that will generate a profit and if we can’t I would like to just quietly shut down. If we do find the avenue to profitability we will need to move fast and furious because we will have a lot of competition copy us and we’ll need to preempt that. As you know, I was very pleased with the presentation although we’ll probably go through some evolutions in presentations but using video on the blackberry and iphone is very powerful. I want to make a video message for our web page that will explain that one of the reason I started this service is to present information/news in an unbiased manner without any subliminal messages – just the facts of the story. This may be difficult in some instances as there could be more than one interpretation of a news story. 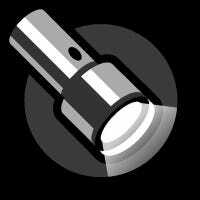 In the instance where this may happen I would like to offer the availability for the customer to contact me and tell me about it. This will allow the opportunity for input from our customers allowing us the opportunity to achieve a better position of honesty and it will allow me to keep my finger on the pulse of our activities. I read the DNAinfo article on [Rick] Perry. I thought it was balanced and interesting until the end where there were too many quotes from anti-Perry people. I asked Leela what she thought of the article without telling her my point of view. Her feeling was the same as mine — good until the bottom where there are too many quotes. Per her note below, she is addressing now. I’m not sure the opinion in the Taco truck article was correct. I’ll bet many neighbors didn’t want the truck there. Are we hiring too many bleeding hearts? We received your email about the tone of the Taco Truck article. Alfred had already advised me about your concern and have I reiterated to the staff our editorial mandate of reporting the facts, and not communicating opinions whether expressly or implicitly. The staff and I take your editorial mandate of objectivity extremely seriously. In the case of this taco article, the reporter and the editors on the story intended only to report the type of neighborhood story that differentiates DNAinfo from every other outlet in Manhattan. The story followed sound editorial standards by including a quote from the truck’s owner, a quote from the resident association that opposes the truck, and a quote from a resident who likes the truck. It was edited by editors before being published. I am 100% committed to making sure DNAinfo reporter follow your editorial mandate of impartiality – it is not only what our boss says, it’s the right way to report news and information. Thank you for the confidence you place in me and let me assure you that everyone on the editorial staff is doing everything they can to be objective while perfecting a business model. I’m starting a new information (news) delivery company and we’ll be up and running in Sept. This will be digital delivery but coming to iphone and Blackberries as well as the computer. I’m starting with local news in Manhattan because if I can make it there I can make it anywhere. We will not offer any opinions in the general news. We will offer in-depth reports that may offer opinions but this will be done by other reporters and it may come by subscription. We’ll have to test. I’m tired of getting slanted news. I think news has been turned into propaganda. Why would other sites link to us and would we link other sites on ours? Thanks for sending Web. It will be interesting to see if there is a response. I think this article is evidence that the radical left press will continue to trash my reputation. This opposition has no shame and will continue print non-truths to their advantage. For me it is interesting to see how “they” work so that it can help me formulate strategies. On a personal note - I think that I told you that I enjoy taking risks and don’t feel comfortable without business risks in my life. For me, turning those risks into something viable, a profitable business, a positive cash flow and all the wonderful prosperity that follows is the most exciting thing that I can experience. Thank you for helping to make my life wonderful and exciting. I see a lot of new faces around here. Is that because I’m not here that often or is the turn over high. What is our turnover rate. Also, I don’t care, but are there more women that like to be in News than men. What is our gender relationship? I would like to see the word Neighborhood used more effectively. Perhaps we should use Neighborhood Business instead of Small Business. Saying this was a HUGE SUCCESS without knowing the exact objective makes me uncomfortable. Our objectives should now start turning to PROFITS to measure success. I’ll be talking to you about this. In the Friday WSJ on page A21, Opinion, the is an article by Allan Meltzer on the status our economic situation. Allan is the most Intelligent, honest economist in the world in my opinion. You might want to read this article – I think you will know that our President will not follow the advice so the result is going to be ongoing economic trouble. Allan is the kind of respected economist we could put on DNAinfo and charge. However, it has to be done in the right manner. I’m starting to get excited about what we could charge for. To: [Friend and Omaha businessman] G.E. Across the country newspapers and traditional news of TV stations have been losing readership and viewership. They are dying. I don’t know about magazines, probably depends on content and target market.It is my opinion that we don’t get “NEWS” anymore, we get propaganda, both from the left and the right. Apparently the new media will be digital. Many people have been studying this for the past several years including myself. There are a number of digital start-ups that have come to market over the past several years and millions of dollars are being spent in trying to find the profitable delivery material and/or niche. I am just starting a digital delivery system in Manhattan for local news called DNAinfo.com, a big risk but if I can make it profitable the success may be large. This is the kind of risk that I like. I would say that starting a newspaper would be disastrous and I don’t know about a magazine. You may want to do some market research. Hope this is of some help. I hope this email finds you doing well. Please find some suggested titles below. Sorry it took a little longer than expected, but we have been focusing grouping and I wanted to see if any buzz words or ideas came up. Two things we learned int he focus groups that I think you should take into consideration - 1. tie it to the economy 2. the word responsible kept coming up, which is interesting because there was an article recently about how the White House using the word ‘responsible’ now. No coincidence - its something that is resonating. There are two ways you can approach this title - 1. make it outright about the Unions in order to make it politically charged enough to grab attention or 2. you can have a more sensible title that may give you more creditability from the start - however, you aren’t saying up front what its about. Having said that, it really depends on who your audience is and what your goal is? I can go on and on about this, but probably not best in email. If you would like to further discuss, please let me know. We can chat by phone or I might be in Chicago in the coming weeks. This is just a short list of a longer list, please let me know if you would like to see more. This idea is key to our success. The Democratic Party is a subsidiary of the Unions and their message is always “on target” of what they, Unions, want to achieve. It is this money discipline that makes the Democrats so successful. If we want to win we need to do the same thing. This means that leadership comes from a small group of key donors. From: [Huge enterprises project manager] M.S. For the past several months I have included $25,000 set aside for your contribution to the development of the book on public sector unions which is being overseen by Mark Mix. The overall commitment you made last year was $90,000 per the attached email, and so far you have donated $65,000 in support of the project. I get the impression, however, that the project has been shelved for the time being and I’m unsure whether Mark Mix expects you to fulfill your remaining obligation. Your questions are good and we know the answers. This type of work has become as disciplined as any science. We don’t spend large amounts of money based on personal judgment or preference but on market research so we have a pretty good idea of the amount of influence. The so called Super Pacs are necessary to offset the spending and influence of the unions, especially the government or public service unions (which I think are immoral). Of course, the radical left press, usually called the main stream press, is going to be against the Super Pacs because they are aligned with the unions. In the last 40 years the Democratic Party has been taken over by the unions and the kooks are now in charge. The grand ole party of the people like Jean Kirkpatrick and Jack Kennedy is gone. I call the current Democratic Party a subsidiary of the unions. If Obama gets re-elected our country will have crossed the “tipping point” from being a free enterprise economy to a welfare state. I can state this so confidently because of the large National Debt. This national debt has gotten so high that if we do not start bringing it down we will not have control over our national financial disposition. We will have become the worst generation in American history by passing on this debt to our children and grandchildren and limiting the options in pursuing their happiness. FYI. I’m going to follow this closely and work to defend the Governor. I think the judge is completely out of line and a pawn of the unions. It is terrible and shouldn’t be allowed to happen. My tax dollars go to the government which in turn pay the public employees, which in turn pay my dollars to the Unions which then use the money to support candidates that I do Not want. It is a crime and in a roundabout way makes me a slave. We should pass a law NOT allowing Public Service Unions as they are a disservice to the tax paying citizens. Y’all gotta keep this one circulating, please! I started DNAinfo with the goal of building a successful company that would report objective neighborhood news and information. The publication of private emails, which were taken without my knowledge or consent, doesn’t change the fact that the company’s editorial standards never wavered. I remain proud to this day of the excellent, unbiased reporting we did during our 8 years of operation. I’ve made no secret about my feelings when it comes to unions. In fact, I published a blog post in 2017 entitled, “Why I’m Against Unions at Businesses I Create.” In today’s business environment, the companies most likely to succeed are those where ownership and employees are truly in it together, without interference from a third-party union that has its own agenda and priorities.